My son, terrified, did exactly the opposite of what I’d taught him: He dropped his scooter and started running to me with the dog following on his heels. I started yelling ferociously and waving my arms menacingly and she backed away, intimidated by my approach. Whether someone is fearful or experienced around dogs is unimportant. Dogs should not be allowed to scare children. If you own a dog and live in a densely populated neighborhood, it is important to train your dog not to chase children, bikes, cars and other passersby. It’s a simple skill and can often be taught (at least by me) in a single lesson. Is the dog who ran at my son a “bad dog?” No. She is, in my opinion, a well-loved but improperly managed dog. Many dogs, particularly protective breeds like the GSD, need to be carefully and responsibly conditioned to reference their owner for direction when life presents the unpredictable. Let’s look at this situation from the dog’s point of view. As puppies, all dogs are generally self-inhibited and focused on their owners, but by 6 months old, puppies begin to branch out into their breed-specific roles. Herding breeds begin to look for things to gather, retrievers scout for items to retrieve, and protection dogs begin to define and protect their property. Once these habits and routines are set, dogs often shed the social inhibition that harnessed their intensity as young dogs and grow more and more determined as they mature. 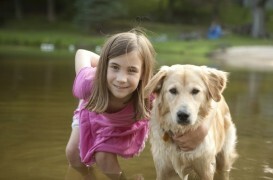 By age 2 or 3, protective breeds–unless taught to look to their owners for direction–can become reactive and difficult to handle around strangers, kids or other dogs. They can become defensive in their home and yard and protective of their personal space when restrained. While it takes some time and effort to mindfully teach these dogs to inhibit their impulses and respect your rules, it is a process that is fascinating and effective if you choose the right trainer to help you along. Unfortunately many trainers limit their clients understanding of their dog, using an approach that merely teaches the dog to obey a limited set of commands. Neck collars are employed to “correct” the animal if he/she doesn’t obey. This approach sets the dog apart from the person and does little to teach people and dogs to communicate and work together. The dog that chased my son is similar to many of my clients’ dogs. I’ve observed her since moving into the neighborhood in July and noticed her breed-specific tendencies begin to emerge. As she grew into adolescence her perimeter barking both inside and outside the home began to increase. Left unchecked, the barking was often prolonged. On walks she would often would bark when startled, another issue I see often in my private practice. Dogs bark at other dogs and people while on a tightly held leash because they feel trapped and threatened by the unknown. As I detailed in my article on leash walking, it is wholly unnatural for dogs to be on leashes and all dogs must be kindly conditioned to walk with their people and to “check in” for direction when they’re startled or confused. If this doesn’t happen, the dog grows more and more suspicious of strangers and reactive. What concerns me most as a Mom? It is what I know as a trainer. As dog matures (a course that takes from 18 months to 3 years) they loose their social inhibitions. The menacing barking becomes a nip or bite and heartbreak follows all around. All dogs–big, small and in between–should never chase or frighten children. It’s not “just play” and it’s not “just what dogs do.” But most importantly, it’s not necessary. The solution is not to punish or isolate dogs, but to kindly train them to live among people so they can be a welcome part of any neighborhood.